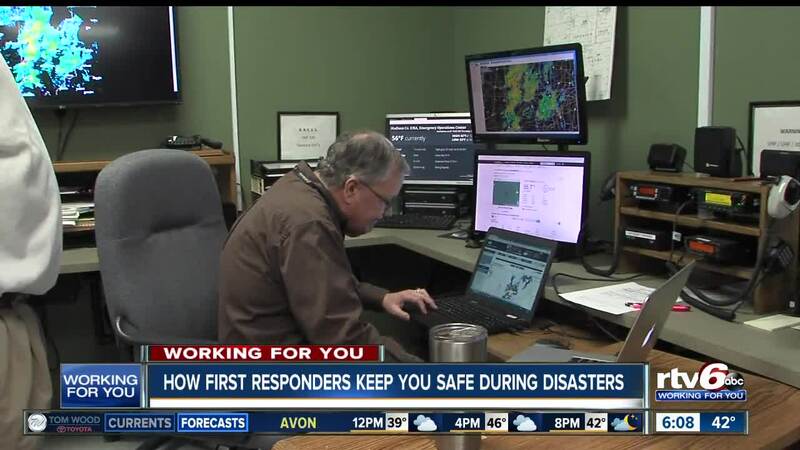 MADISON COUNTY — When severe weather strikes central Indiana, we often head to the lowest level of our home or business and stay away from windows, but first responders head to a place where they can track storms and help keep you safe during a disaster. During a major emergency, Emergency Operations Centers (EOC) are activated and become the nerve center of the response for the emergency. Those EOCs are filled with the key decision makers for police departments, fire departments and other first responders that are tracking the storm and coordinating all elementas of the response. Most counties have at least one EOC. Marion County, for instance, has at least four of them. In major disasters, a statewide EOC is activated at the Indiana Department of Homeland Security to help local counties with their response. RTV6 got an inside look at Madison County's EOC. During an emergency, the heads of each agency sit around a large table and able to communicate face-to-face about the storm, where first responders need to go and what resources they may need. Behind the sizeable main table, rows of tables are set up for additional staff from each agency who can help the agency's department head gather information, communicate with crews in the field and assist with other things needed by the agency. TECHNOLOGY INSIDE THE CENTER ALLOWS THEM TO MONITOR WEATHER CONDITIONS, COMMUNICATE WITH FIRST RESPONDERS AS WELL AS TRACK THE STORM.